The next time you pick up a product and admire it for its sheer beauty, simplicity or functionality, you can thank people like Jessica Yeh and Narbeh Dereghishian. Students at the Art Center College of Design in California, Jessica and Narbeh love nothing more than improving life through innovation and design. When they were both offered the opportunity last fall to spend two weeks at a campamento (or slum) in Chile, researching how to design basic tools that would improve the Chileans’ lives, neither realized at that point just how big of a difference they were about to make. 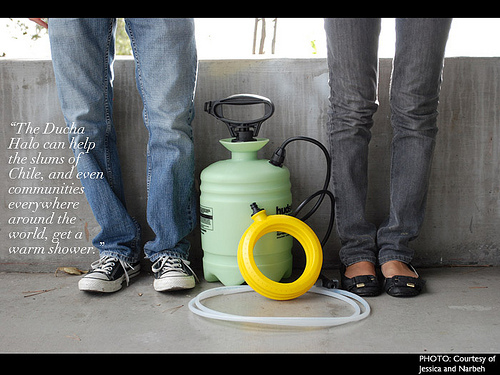 The result of their research and efforts is the Ducha Halo, Spanish for “Halo Shower”: a low-cost, portable tool that makes taking a warm shower as easy as 1, 2, 3 – you heat the container on a grill, pump the handle to pressurize the water, and step on pedal to let the comfort of a nice, warm shower wash over you. What made you want to go to school for design? Jessica Yeh: I think it was just something that I’ve wanted to do for a long time. I made up my mind in middle school that I just had to be a designer (laughs). Narbeh Dereghishian: I knew I wanted to solve problems. JY: Design is wonderful, and it can be really innovative and have the potential to help people who need simple things. Just to help make their lives a little bit easier, a little bit better and more enjoyable. ND: Exactly. As for me, I’ve done other projects related to social design, and the one prior to this one was one in Guatemala where I did water filtration for a rural community there. This was right up that alley. When you arrived at the campamento, what did you see? ND: Well, we really had no idea what to expect going there. The first reaction, of course, is utter shock. You need to relax, let go of any sort of judgment you may have on the community, and really absorb what these people are all about. JY: I was shocked and surprised. At the same time, it just hit me that we (the United States) are not that far from South America and yet it’s a completely different world here, especially when looking at the slums. It was amazing at the same time to see how these people lived so happily off of so little. What was the water situation like at the slum, and how were people showering? JY: They had no plumbing, no kind of water system at all. The municipal water truck comes once a week, and they fill up everyone’s water. Their usual shower is just a “pat down” or showering by parts, which means they dip a towel in warm water and then they kind of pat themselves down. The whole process takes about half an hour to forty-five minutes. It’s a big strain physically and emotionally. What does your elevator pitch for the Ducha Halo sound like? ND: Ducha Halo is a cheap, portable shower attached to a 6-liter metal container easy to heat and that allows you to put enough water for a longer, full-body shower. This is a do-it-yourself kit that we’ve designed. It can help the slums of Chile, and even communities everywhere around the world, get a warm shower. Apart from the obvious benefits, it can really help alleviate illness. It also brings a sense of self-confidence to these communities. Finally, Ducha Halo helps reduce water usage by over fifty percent. Why did you two decide upon designing a shower of all things? JY: Everyone deserves a warm shower. Feeling clean is very emotional, as it is physical. I enjoy taking a shower – I love it! And so should everyone else. Or they should at least be given the chance to. ND: I think this can really help alleviate illness, especially among the children. There is a strikingly high number of children with pneumonia in the campamentos. Until we introduced our shower to these communities, a lot of people had never experienced that (an accessible warm shower). When you were designing the Ducha Halo, what design elements were you thinking of? JY: We really thought about what was the easiest experience, what was the most intuitive design for the people there in Chile. ND: Just making the entire (showering) process easier. Either reducing steps or making the end product so valuable that they would want to go through the steps. I heard you use the phrase “social design” earlier. What does that mean? JY: I think Narbeh might have a better explanation (laughs). It’s people design. 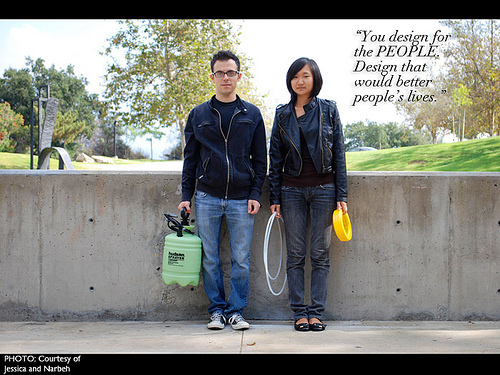 You design for the people. Design that would better people’s lives. ND: That comes down to innovation for the greater good of people versus innovation for the sake of innovation. I would say that there is a big component of social sustainability, ecological sustainability, and financial sustainability. How can design change the world? Or maybe a better question is, can design change the world? ND: It can definitely change the world, I know that. It can open up people’s minds. 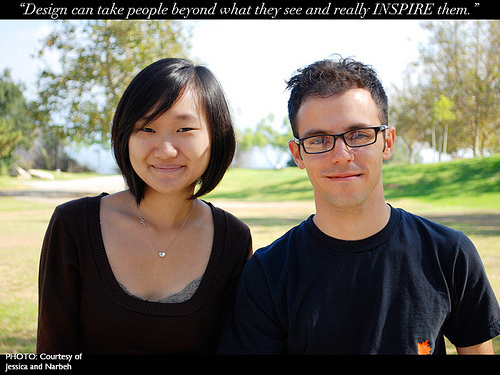 It can really take people beyond what they see currently, and really inspire them. Jessica, can you elaborate on why you think design is important in today’s world? JY: Sometimes I think it’s kind of taken granted for. People just kind of expect things, but they don’t realize how much effort and how much time each thing is designed and calculated mathematically. There was a designer that worked on it and that’s why you’re using it today. Everyone is interconnected with design. You can’t get away from it! Ducha Halo is obviously a tremendous project, and you’ve already won the Bodies In Space Awards last March. What is your goal for the future? JY: We’ve applied to a couple of grants to see if we can create some money to get the ball rolling. Really, our goal was just to make a whole bunch, and send them out and hopefully they’ll help people. As simple as that. ND: We’re still trying to figure out what our correct path should be. Our very end goal is to make sure no one goes without a warm shower. Finally, how can Daily BR!NK readers contribute to your success? ND: I guess in reality we’re really looking for a partner. We’re really looking for guidance. We’ve never done this before. We’re really passionate and were really willing to put our efforts behind this. JY: We would love to hear feedback from other people; that would be really great for us. They don’t have to be a designer – they can be anyone. It’s just nice to hear what they have to say.